n January 1960, the new coins came rolling out of the mints, as usual. The cents, however, had a minor problem: The last two digits in the date were smaller than normal, and the "0" had a doughnut-like appearance rather than the normal bicycle-tire look. As a result, various die breaks and filled dies occurred, and before the end of the month, the Mint decided to remake the master dies, enlarging the last two digits to conform to earlier dates. This resulted in an immediate scarcity: the small-date 1960 cent. Only a few million of these small-date cents were released from the Philadelphia Mint, and several million from the Denver Mint. Likewise, the proof sets that were released in January were of the small-date variety; they, too, were quickly replaced with the large-date variety. By June 1960, small-date cents were selling for up to $5 each, and small-date proof sets, which normally retailed for about $4 at the time, were selling for $25 or even more. Further examination of the regular large-date proof sets revealed another remarkable variety: a 1960 large date over a small date. Such a variety had never previously been reported in the series, and this variety quickly rose to several hundred dollars. To this date, both varieties are in the $150 to $350 range, since they are very scarce and do not trade frequently at major auctions or in other trading media. Adding to the special quality of 1960 cents, the "D" mint mark  which at the time was applied by hand to each working die  often showed doubling (referred to as "repunched mint mark" or RPM). Some of the early discoveries showed two distinct "Ds," one over the other. Minor RPMs were found later; to date, well over 100 varieties of these RPMs exist for the 1960-D cents alone  both in the small-date and large-date varieties. These are not especially scarce or rare; even the nicest RPMs sell for about $1 to $2 each. A specialty book edited by John Wiles, "The RPM Book," lists more than 100 varieties of 1960-D RPMs in both the small- and large-date format. Collectors who specialize in RPMs have little trouble in finding many of these RPMs by culling through rolls of 1960-D cents. To add to the varieties of this date, several other doubled-die variations are known. 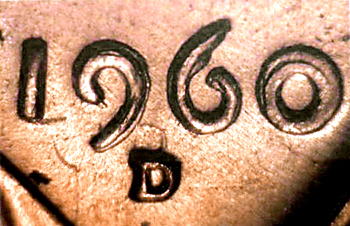 The popular and relatively scarce doubled-die known as 1-0-III features a doubled date and RPM in which the first "D" is well above the second "D" and the digits in the date are clearly doubled, with the small "60" over the larger "60." These coins, in mint condition, sell for $100 to $200. About 15 years ago, the mint mark on U.S. coins was incorporated in the master die and no longer applied by hand. Thus, RPMs in recent years' coins are nonexistent. For more details, refer to "The RPM Book" by Wiles, "The Standard Guide to the Lincoln Cent" by the author, and "The Authoritative Reference on Lincoln Cents" by John A. Wexler and Kevin Flynn. These should be available at local coin shops.